So disclaimer, this post isn't one about nutrition advice or exercise recommendations. This one is for women out there who have felt that tug between their work/career and their family. For me this is about being a mother, wanting to have kids and continuing in my career. I know I have heard that you can't have it all and I believe that in life we make compromises. We give up things in order to do other things. I wanted to take the time and write up my struggle and feelings. I feel like as women, it is different for us compared to men. We are different beings and that should be celebrated. Lots of times though I feel a sense of guilt about struggling with this choice between a family and work. I, like lots of my peers, finished my 4 year college degree and got a job. I have been a Registered Dietitian for 7 years and I now moved through being a novice in my field into more of an expert. I don't know everything, but after passing that 5 year milestone, I feel like I know some things, but of course have way more I want to learn. I would say that I have a career. I have a specialty area where I work that I love. I am good at it and I enjoy the challenges. I have learned some new things about myself as well - my desire to write and possibly run my own business in the future. I enjoy educating people about my specialty area. I have learned those things about myself over the last 7 years and I have worked hard to be good at what I do. I am also a mother and have a child. A 15 month old little one, who I love and enjoy spending time with. Now I have this desire to spend time with him and I have thought about do I want to keep working? Being a mother starts bringing all these questions into your mind that never had been there before. I start wondering if that is something I would want to do? If I didn't have a child, I never would be asking these questions. 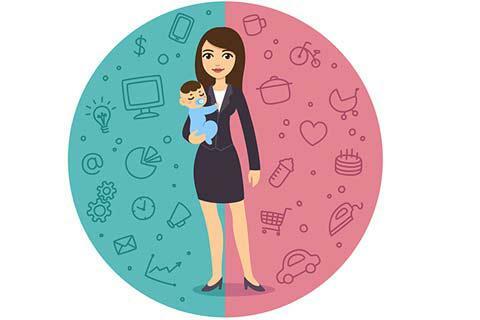 But now, I feel like I am being asked to choose; between being a Mom or continuing with my career. What I find frustrating is this idea that I HAVE to choose. That some how my desire to continue with my career shows a lack of desire to be the best mother I can be. I know not everyone thinks that, but that is the mindset that society puts on us. I believe that as a woman, you have to choose what is best for your family. What do you want from life? What do you want to do? That is what Chas kept asking me the other night. Not what would I would be willing to do for my family. Not what I think I could see myself doing if I had to. The simple question ... where do I see myself in 5 years? Right now, what do I see myself doing? As I look into my crystal ball, I see myself working and continuing in my specialty area of dietetics. I would love to have another child, but I understand that additional strain that would put on me as a working mother. I can't help, but want to have it all. I have worked too hard for my career to just step away from that, but at the same time I want to be the best mother I can to my son and hopefully future children. I don't have an easy answer to that questions ... where do you see yourself in 5 years? I have hopes and dreams. As a woman, I just want to celebrate other woman out there in that pursuit of "having it all." We give up time with our children to pursue our career and we hope that teaches our children how to be successful later in life. We are mothers, but we are also more than just that vocation. We are still the women that went to college to pursue our dreams and in the end, when our children move out, we will still be those women with our aspirations. Is you choose to stay home with your babies or go to work and snuggle your little ones at night ... doing what is best for you and your family is always the right choice!